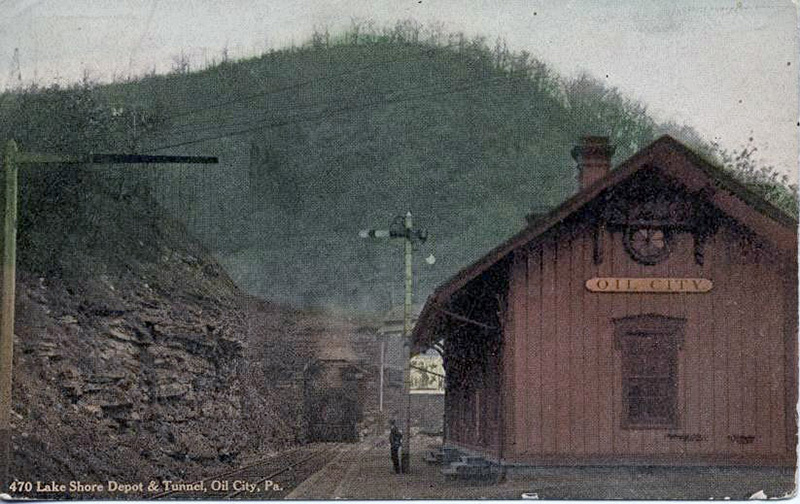 During the late 1860s, Oil City, Pennsylvania saw a frenzied rush by the railroads of the day to secure rights-of-way through what was at the time still a small borough. Getting trains north into the Oil Creek Valley and its surrounding boom towns was of paramount importance in the quickly expanding business of oil production, still in its infancy. 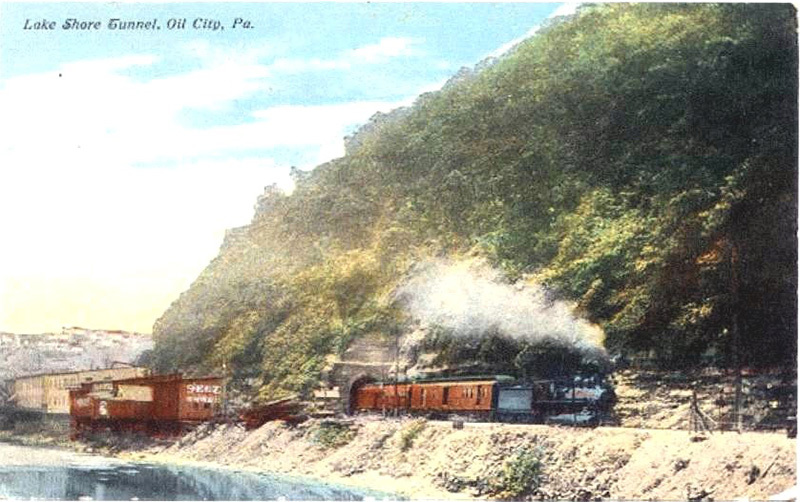 The railroads were quickly replacing the need for horse-drawn wagons in the business of transporting oil the “old-fashioned” way, in wooden barrels. The ingenious Densmore tank rail cars were much more efficient for moving huge quantities of crude oil. One of the late arrivals to the railroad scene was the Lake Shore & Michigan Southern Railroad. 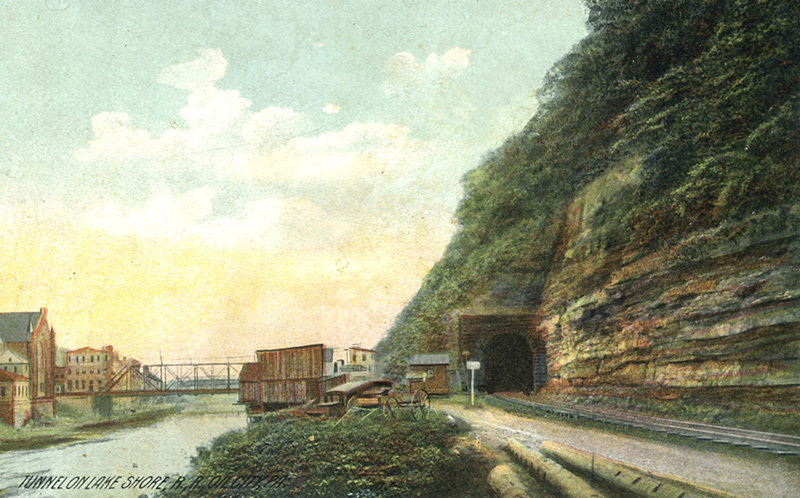 Their attempt to secure a right-of-way up into the Oil Creek Valley in front of the “Hogback” for their Jamestown & Franklin branch failed, leaving them no other option but to tunnel right through the mountain, just 300 feet within the hillside for a total length of ¼ mile. The tunnel was completed in 1870, at a cost of over $100,000 (approximately $2,000,000 in today’s economy). 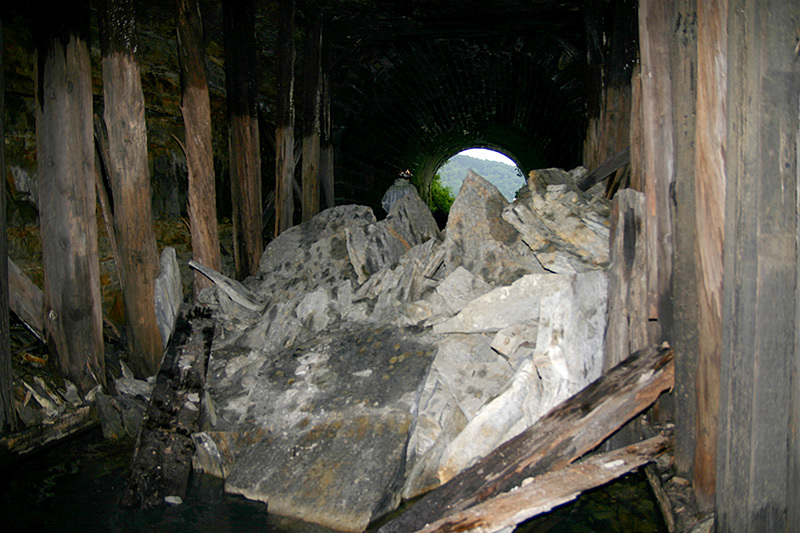 The tunnel’s northern entrance/exit as seen today. By the 1960s the tunnel had long since been abandoned, so the City of Oil City permanently sealed the southern entrance, which resides in the right-of-way for State Route 428. The northern entrance remains open, however over the past several decades, a gradual breakdown has been occurring 100 feet inside the entrance that has resulted in huge pieces of ceiling falling into a pile of rock 15 feet high. 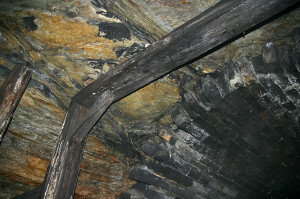 Original wooden timbers that once supported the ceiling are no longer connected to any rock at their tops. A coal seam is now visible above where the original ceiling once existed. 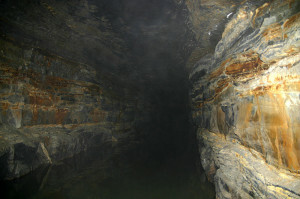 As highway crews have pushed shale debris from the exterior hillside up against the entrance to the tunnel, a dam has been created, leaving seeping moisture within the tunnel with no escape. The result is an underground river, three feet deep, for the entire length of the tunnel. 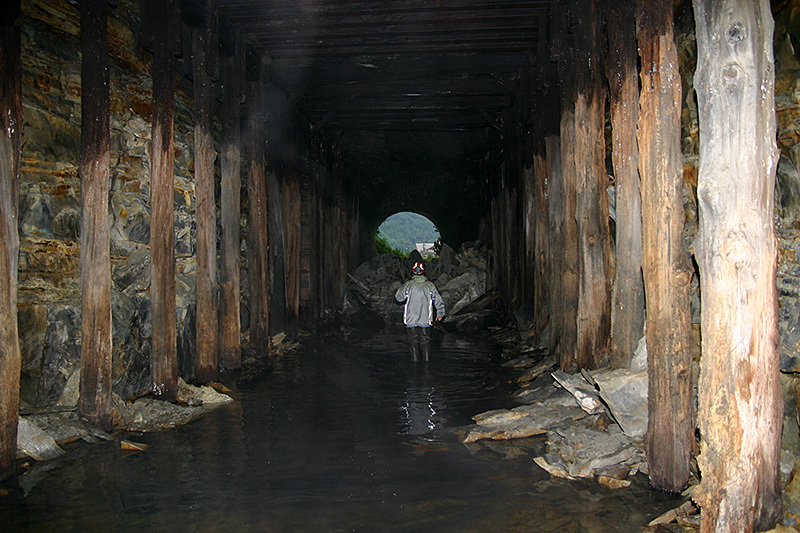 The rails have long since been removed, but most of the ties remain intact underneath the water. Wow, Mike! This is amazing. I forgot all about that tunnel. Thanks for the terrific photos and story. 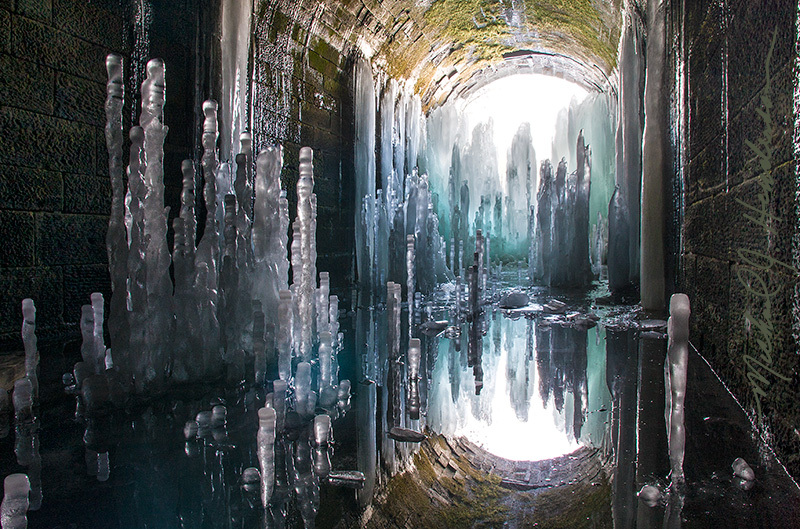 I have always been intrigued by this tunnel, thanks for the interesting read, and as always, beautiful pictures. 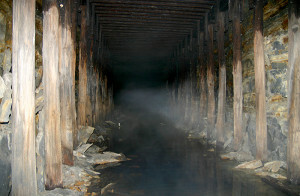 My interest in this tunnel along Rt. 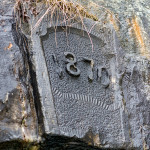 8 just north of Oil City, PA.
Great pictures of a historical part of Oil City ! Amazing how history can be preserved if it is ” just left alone”. 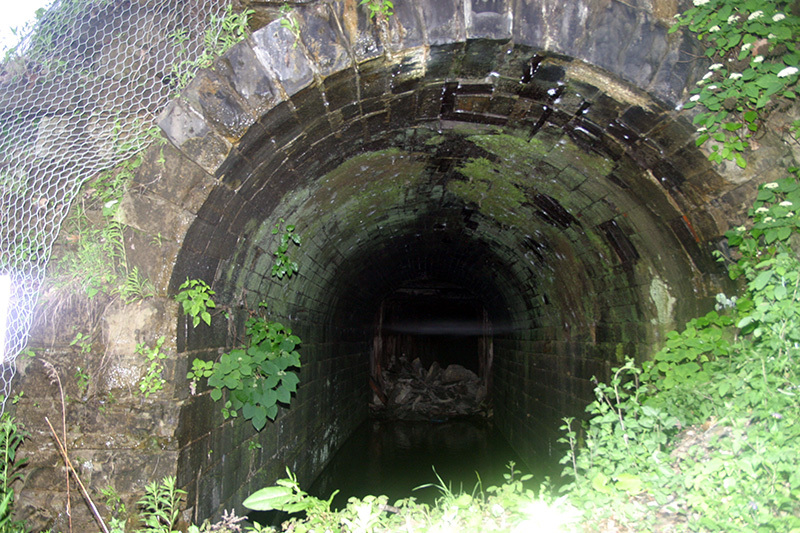 I vaguely remember riding a passenger train trough this tunnel when I was very young, probably in the late 40’s. It must have been some type of excursion. Wow, Jack, that would be an interesting story to share! Thank You for sharing your adventure and providing the history information Mike. 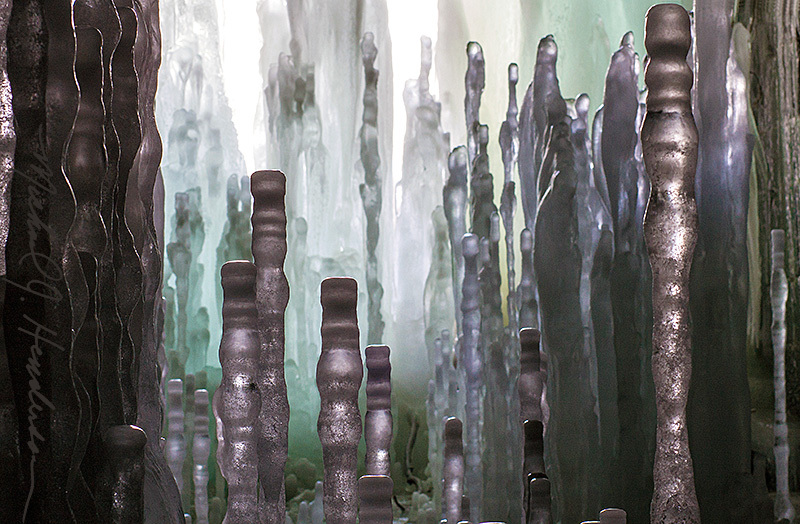 The pictures of the ice formations are fantastic! Thank you for the pictures. 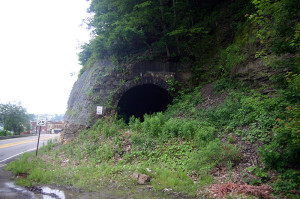 I was born and raised in Oil City and have always been curious about what was inside that tunnel and the history of it. Thanks for the background and the pictures so I don’t have to venture in there myself! 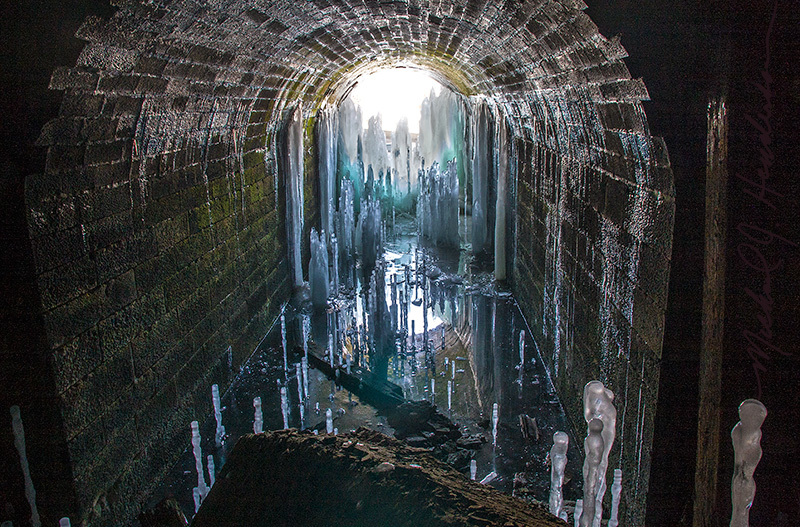 Beautiful pictures and history of this tunnel. When was the last train to use the tunnel..? Still trying to find out, Carol! One person says she thinks she rode one of the last trains through it in 1941. Love these pics!!! I grew up on Halyday Run & my dad would tell me stories of h walking through the tunnel !!! I just love the old pictures of our town & it’s history!!! Thank you for taking your time & sharing!!!! Exquisite photos. 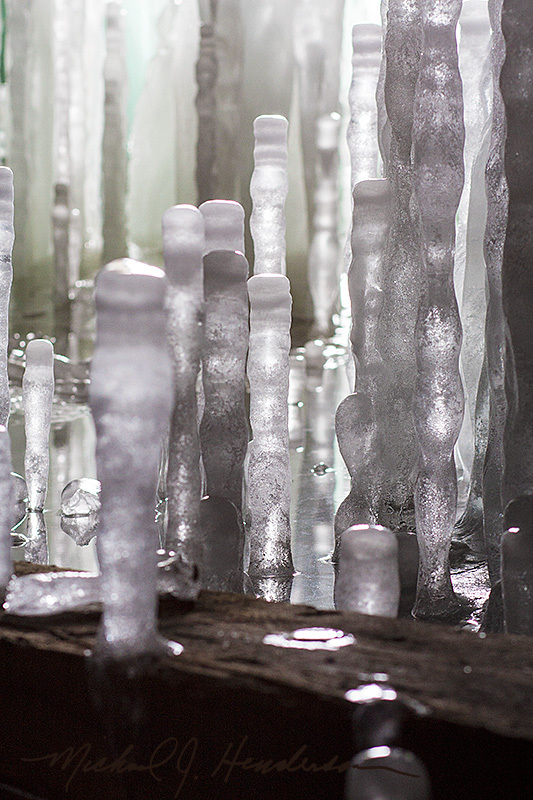 Reminiscent of the ice caves in the Apostle Islands off Bayfield, Wisconsin in Lake Superior which have drawn thousands of visitors in recent years. It was not easy, trust me! 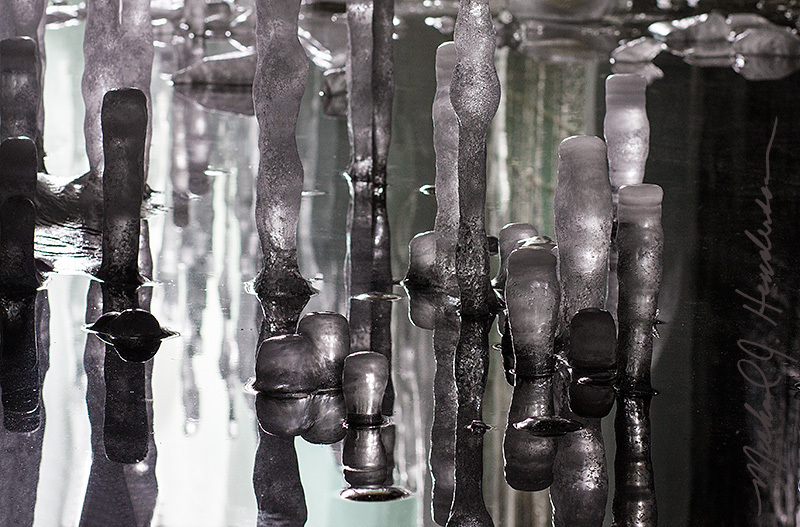 There was a narrow passage between two columns that we just barely squeezed through. 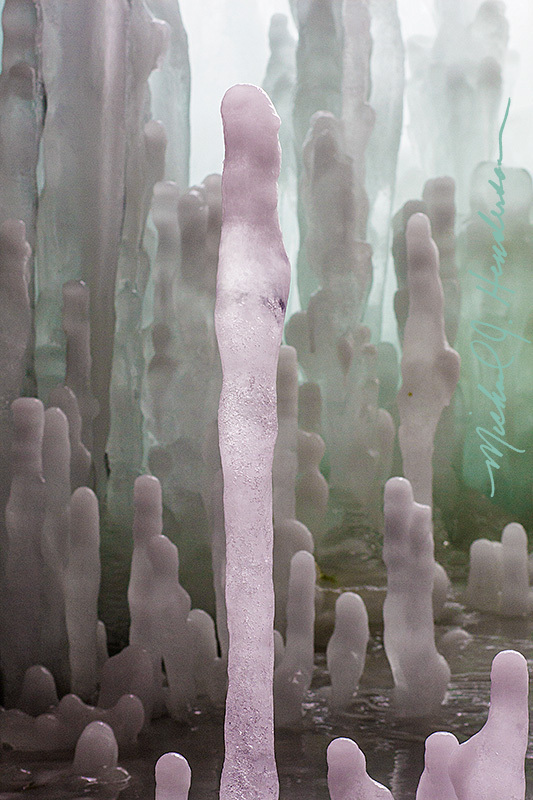 And once through, we had to slide down a mound of ice. Getting back out was particularly hard, because we had to make our way back up that mound. I wore Yaktraks; otherwise, I’d never have gotten out. 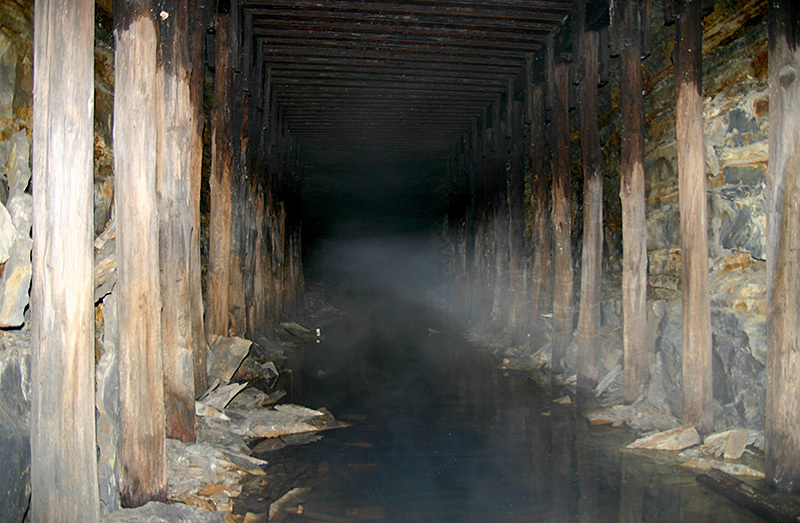 Extremely interesting photos and history of the tunnel. 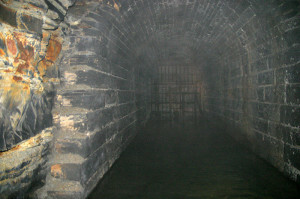 I am so interested in these old tunnels and their history. It amazes me how they were built in the day of simple tools and engineering. How they knew exactly where to come out at the right height and at the right location always amazes me. Like at Kennerdale and Rockland, taking 6 miles off of the river and going through the mountain side and keeping the same elevation and making the curve. No computers, no lazers, just sweat and blood. Is there any remains or indication at all of the southern portal where 428 is now? Really appreciate this history. Thank you! Interesting article. Born and raised in OC and knew the tunnel was there but never ventured in. Great pix. Thanks for posting this. I grew up in Franklin & now live in Warren. Drive by this tunnel often. My husband has always been curious about this tunnel. I know a little about it but not much. Have asked around gotten some general info but not details. I have told him. Eve really something will show up in Facebook & here it is. Thanks so much for sharing!! Hi Mike, great photos! 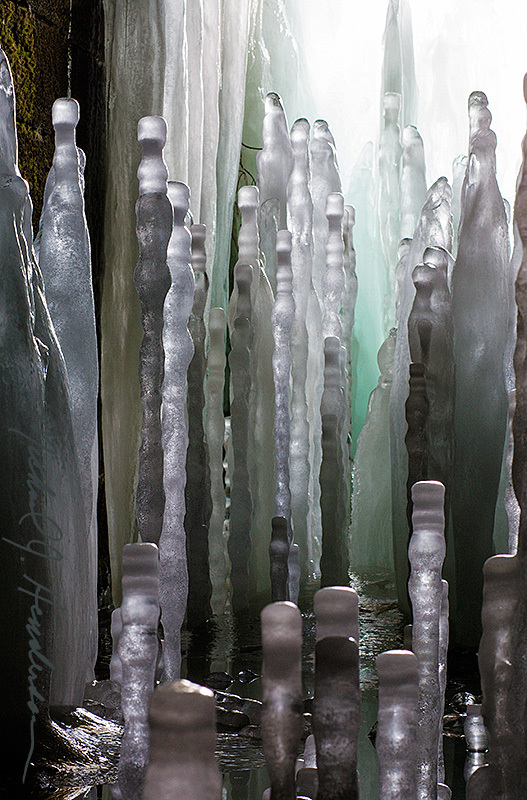 I’d love to check this place out, but i’m having trouble finding an exact location. I am familiar with the clarion area, not so much oil city. Best way to find directions? 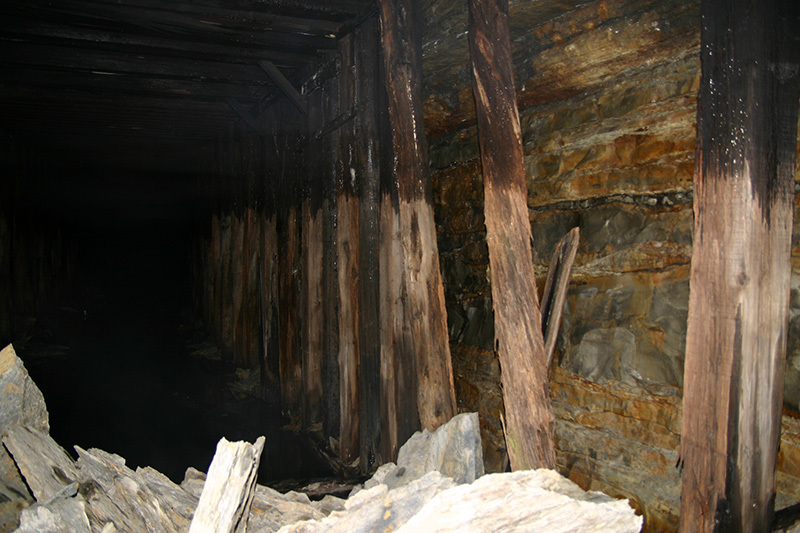 Hi Mackenzie, only the north entrance to the tunnel is visible now, and it’s partially covered up by shale from the cliffs. But it’s along the Route 8 bypass that goes past Oil City’s north side.